And the New England weather strikes again! Ok, for all of you who aren’t blessed with Boston weather, this summer has been weird! hot, cold, humid, rainy, dry- it’s ridiculous. It makes planning a menu for the coming week difficult! Last week was pretty humid so I decided that I would definitely be able to fit some grilling in during the week. Well, Tuesday, when I went to light up the grill, it was drizzling, cool and super windy. Lighting my mini charcoal grill with matches was um, a bit challenging! My roommate, Allie, came to my rescue though and schooled me on grill lighting. After he helped, I had the grill blazing within 5 minutes! Of course, with the wind, I was 92% sure I was going to burn my apartment down. I caught myself staring at the dancing flames with huge eyes, shoulders tense, knuckles white while gripping some fancy tong thingies, just waiting for something to catch fire. BUT we all survived and I had a wicked yummy dinner to show for it. Use a 6-quart slow cooker. Soak your beans overnight and drain. Put the drained beans into your slow cooker, then add the chopped garlic, broth, tomatoes, cumin, and chili powder. Stir well to combine. Cover and cook on low for 8 hours. *The original person who posted this recipe suggested using the Quick-soak method, which is bring your dried beans to a boil for 10 minutes, cover and let sit for 1 hour. This did NOT work for me. My beans ended up being crunchy after 8+ hours and I had to put them on high for an additional 3 hours. Save yourself the trouble and soak them over night! Mix all the ingredients together. 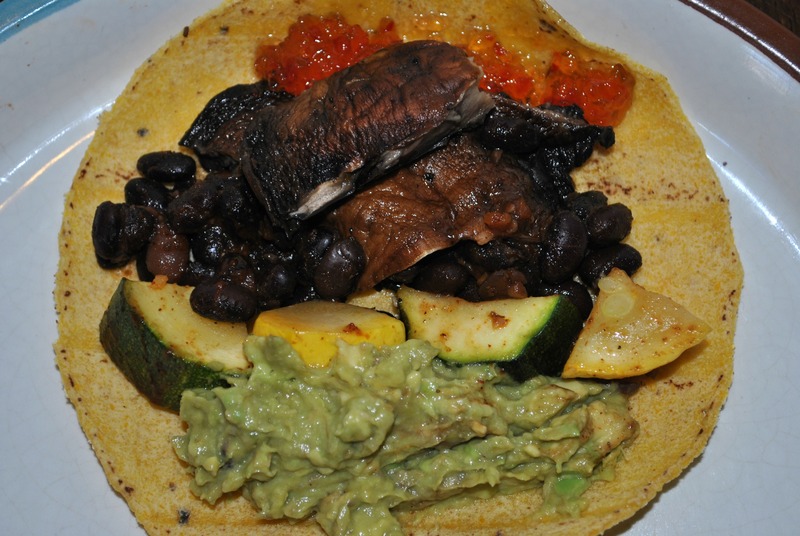 If you have left overs, store them with the avocado pit. It slows the browning process a bit. Dice up the summer squash and the zucchini. Toss them with 2 TBSPs of olive oil and 1-2 tsps of Mrs Dash Fiesta Lime Seasoning (depending on how Fiesta-y you want your vegetables). 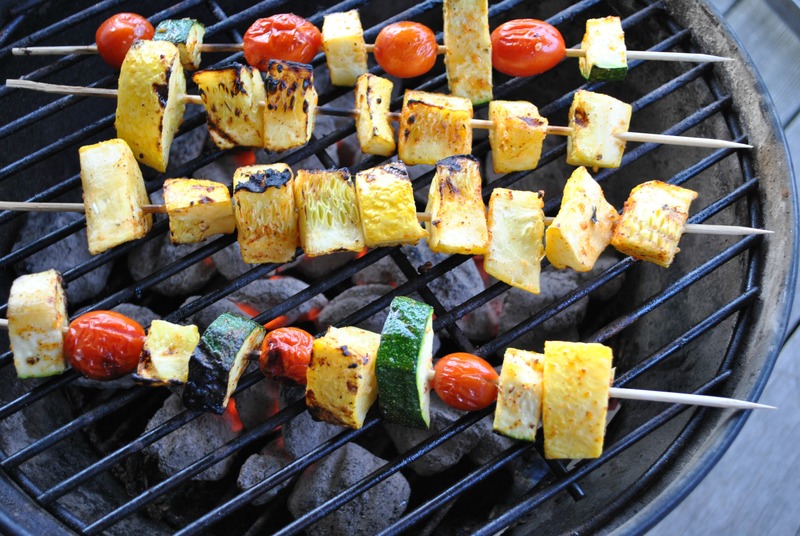 You can either skewer the vegetables after you are through tossing them or you can wrap them in foil, whichever you prefer. Both ways will give the veggies the smoky taste of grilling but the foil wrapper will take a bit longer. Brush the mushroom caps with the remaining TBSP of olive oil and sprinkle with salt. Place the vegetables on your grill (I have a charcoal grill so I have no settings. I would imagine its about medium heat though). Cook until tender about 15- 20 minutes on the skewer, 20-25 in the foil pouch. Place the mushroom caps on last. They will only take about 5-10 minutes. 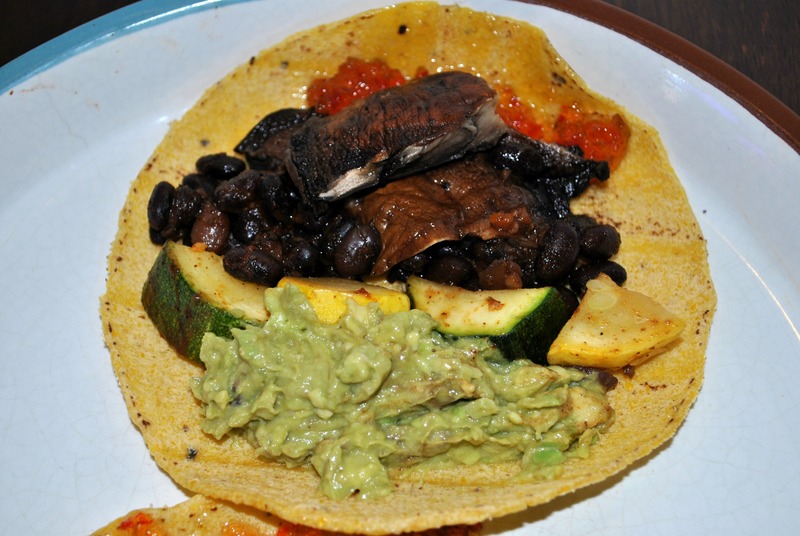 Slather your freshly cooked beans, grilled veggies, guacamole and other toppings onto your taco shell and enjoy dinner!! Seriously? Why does that mushroom at the top of the picture look so weird?? This recipe seems long and complicated but the great thing is, it really comes together pretty fast. The beans cook over night and while your at work and the veggies cook up pretty quickly on the grill. While they are cooking you can make the guacamole. And it doesn’t require you to heat your oven up! Plus, you can substitute in almost any veggies you find at your local farmers market- peppers, onion, different mushrooms, tomatoes, etc. Yeah for summer food!